Fusedspace is an international, on-line competition for innovative applications for new technology in the public domain. Technology has not only changed the way we use public space, it also has brought about its virtual expansion. Through technological innovations like the Internet, text messaging, mobile communication, intranet and gps we can freely share information and develop a community life on the web. One can meet people, assume a meaningful identity and exchange thoughts. In the privacy of one's own room the world has become infinitely larger and more noisy than the world out on the street. 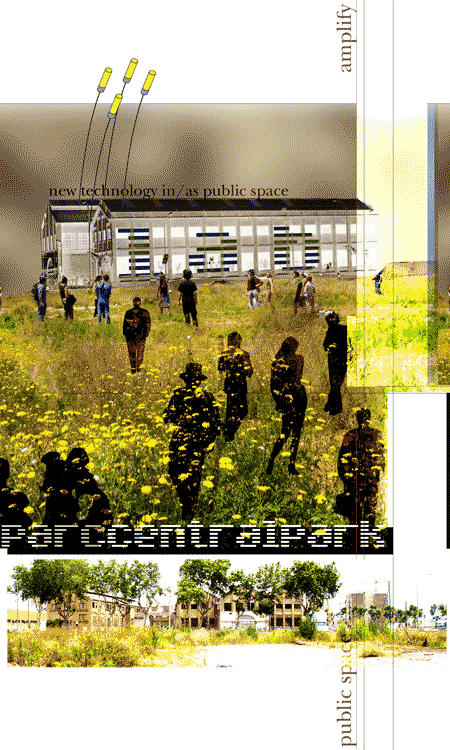 Some of the idealistic concepts of what public space should be are being realized in virtual public space. Within a few years time the whole city will be jam-packed with cables providing fast connections everywhere. It is up to artists, designers and architects to find an answer to the question how current technology can breathe new life into the urban environment and into public domain. The emerging virtual space and urban space increasingly are being privatized and are becoming more and more exclusory. Now is the time to occupy space for public use through the development of meaningful ideas. Public space is by no means dead. It just has to be looked for at different places. Stroom, SKOR, Premsela and 'de InformatieWerkPlaats' have organized this particular competition so as to investigate the nature of the relationship between new technologies and public space. Through an international open competition, the organizers intend to put on the agenda the theme 'groundbreaking interventions in public domain' under the umbrella of Fusedspace. Fusedspace collaborates with V2_ Institute for the Unstable Media (follow-up), Doors of Perception (network) and Electronic-highway Platform Netherlands (arbitration). Definitions= Public space : the physical collective space that is freely accessible to everyone. Virtual public space : the space created by the Internet and other kinds of technological networks like sms, and mobile phones accessible to everyone. Public domain : both the physical and the virtual public space; the commonly shared space of ideas and memories and the physical manifestations that they embody. Fusedspaces winners 2004: Ulrika Wachtmeister with Transitions (a conceptual project exploring the domain in between the private and the public, the virtual and the physical, memories and present, through the development of a fictional company offering alternative spaces for commemoration and mourning), Joes Koppers and Susann Lekås with OPTIONALTIME/ public expanse (uses new new media to make a non-linear experience tangible in public space, this infuses the public to understand their surroundings in a more dynamic way; it appears as a big mirror that in fact is an interactive movie), Marcus kirsch and Jussi Angesleva with Urban Eyes (a service combining 2 natural networks, the CCTV and the pigeon population in a city to provide an alternative, living extension for the view on our surroundings).